Every few hundred years in Western history there occurs a sharp transformation. Within a few short decades, society – its worldview, its basic values, its social and political structures, its key institutions – rearranges itself. 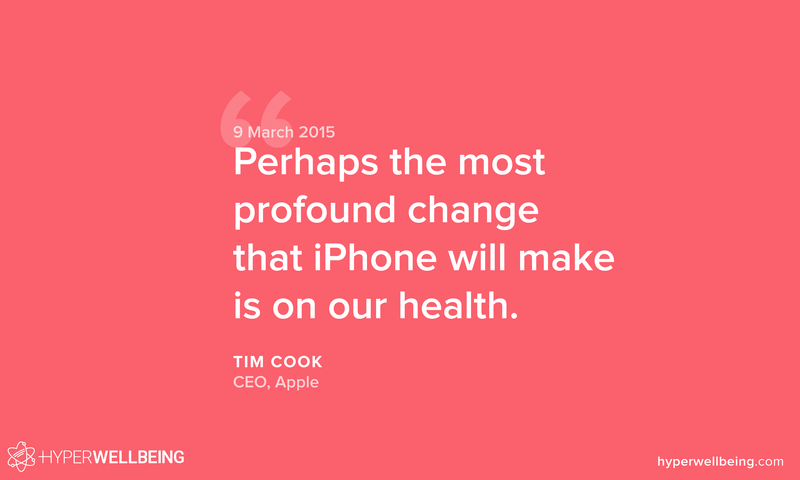 Today our best starting point is facilitating wearables and mobile towards sickness (e.g. lifestyle disease) prevention; wellness optimization (e.g. real-time data-driven highly personalized, fitness, nutrition, sleep, stress etc. ); bolstering health “assets” (e.g. stable relationships and positive emotions); fostering self-awareness (e.g. from physiology to states of consciousness); and augmenting human intelligence with machine intelligence so that we may make better wellbeing related life decisions. It requires fostering the birth of a new industry ecosystem that is complementary to today’s healthcare. The healthcare industry itself is undergoing a “digital transformation” using computation. However this new ecosystem is to be built around a converse trend, which is computer science moving towards health. Rather than being passive (waiting for us to get sick first) and focused upon “sick care”, it’s focus is empowering us to be proactive in order to prevent sickness and to continually enable us to upgrade our existing health. It’s foundation is data science. Today, our most pressing health issues are caused by the lifelong, daily interaction among our genetics, environment, and lifestyle choices – a dynamic interplay of biology, our environment, our psychology and our behavior, interwoven. Previously the majority of illness and disease were the result of bacteria and viruses. Now personal choices are the leading cause of death ; diseases driven by lifestyle are the leading cause of death globally. Non-communicable diseases (the four main are cardiovascular diseases, cancers, diabetes and chronic lung diseases) accounted for 38 million, or 68% of the global deaths in 2012 . This is up from 36 million, or 63% in 2008, which itself was up from 60% in 2000 (31 million). Yet a recent study concluded that only 2.7 percent of the U.S. adult population has all four of some basic behavioral characteristics that would constitute a “healthy lifestyle” . Today more than half the population of California is either diabetic or pre-diabetic ; globally diabetes has almost quadrupled since 1980, affecting 422 million adults (8.5% of adults worldwide) . Complications can lead to heart attack, stroke, blindness, kidney failure and lower limb amputation; yet “diabetes is the kind of disease you can see coming from miles away” . The solution to lifestyle disease prevention as well as amplified wellbeing will not be found in the form of a pill or syringe; multiple drug combinations and hours of treatment. The solution instead lays in capturing and leveraging “intimate data”; that is data close-to-body and data about how we live our lives. It’s continuous multi-point data rather than just episodic physiological data. In addition to physiology it also includes psychological data (e.g. emotions and stress) and data about how we actually live our lives (e.g. lifestyle factors such as nutrition, sun exposure, physical activities, environment, sleep, relationships as well as various fluctuating rhythms of life). 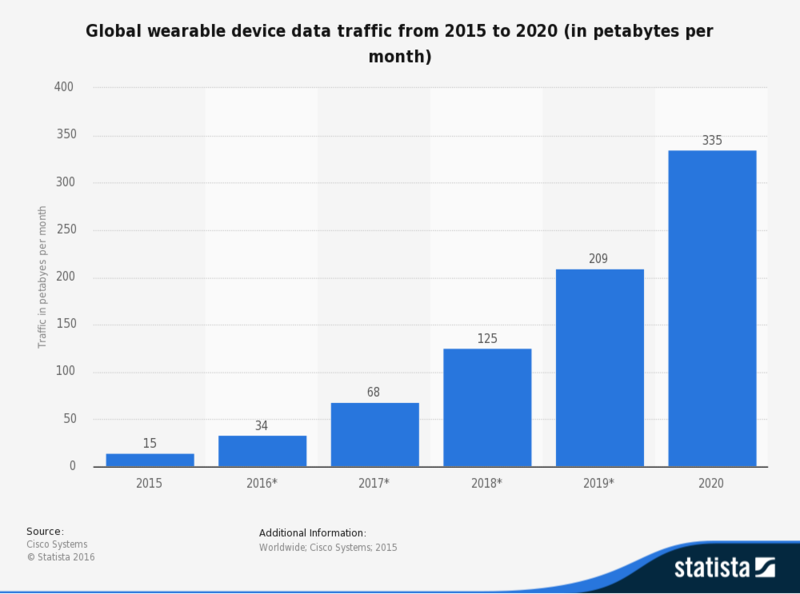 The third computing revolution (“wearables” and “mobile” today) will provide the majority of the data via continuously measured human chemical, physical and electrophysiological signals. Secondary intimate data will be made available by the proliferation of commercial test labs. This will go beyond typical biomarkers and also include our genetics, microbiome, and epigenome; elucidating our biology. It cost nearly $3 billion dollars to sequence the first whole human genome. Now it costs a thousand dollars and the results are delivered to your smartphone which powers a companion life guidance app for “how to best eat, sleep, exercise” according to your genetics. Within five years the cost may be down to a hundred dollars and within ten years it may be practically free. The rise of intimate data is the underpinning of the new industry ecosystem. It will be much larger than what we call the Internet, as defined by the Web of hypertext pages today. Not only in raw data terms, but in its transformative effect. Intimate data coupled with developments in data science is likely to have a larger impact on health than any new drug, device or procedure. 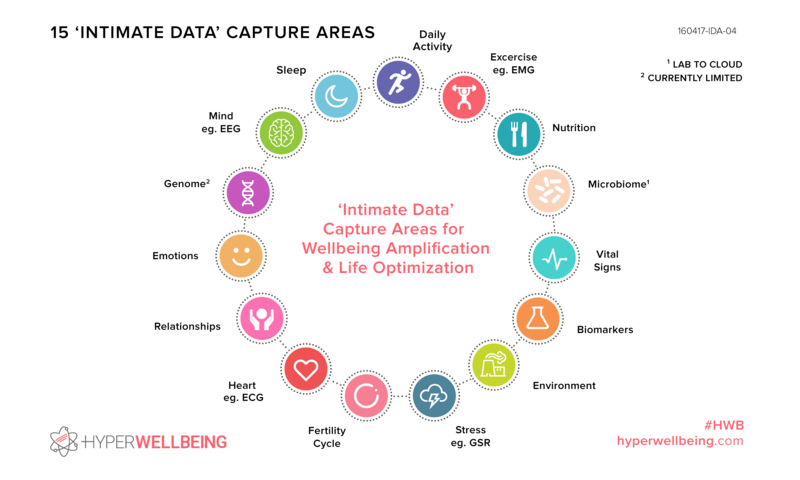 The data will be fed into systems that decipher the complex, interwoven, causative roots of human wellbeing using interdisciplinary Big Data analytics and machine learning. This may be coupled with the latest scientific research (e.g. peer-reviewed medical journals) processed with cognitive computing to help further derive correlation and interpretation. 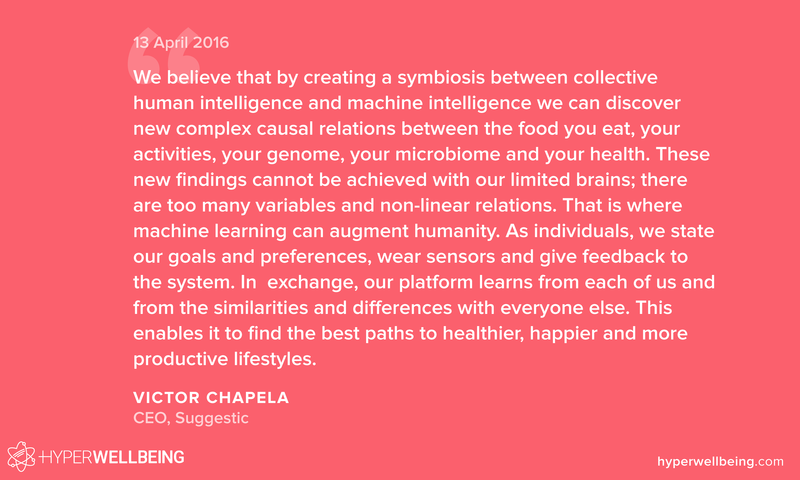 The output will be individualized real-time adaptive behavioral, emotional, nutritional and lifestyle coaching/”nudging”. Of the devices that do move health forwards over the coming decade, the most important may be the smartphone which will also act as the “switchboard” for wearables. 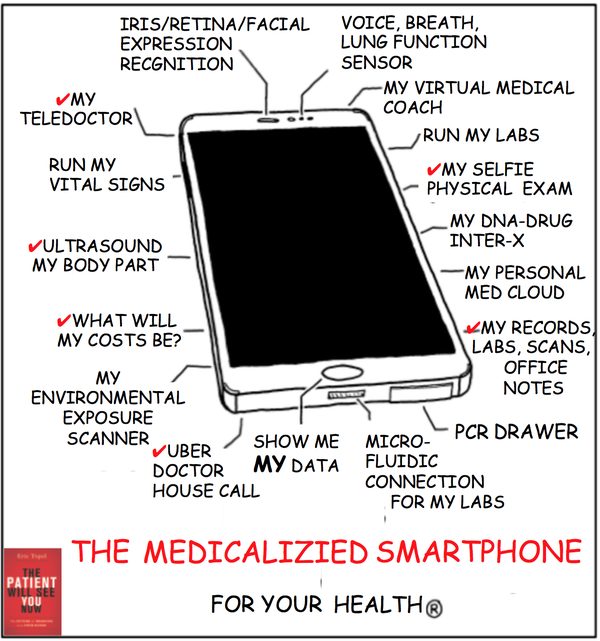 Not only have major wearable manufacturers already committed to medical grade sensors but the mobile phone itself is becoming “medicalized”. Smartphones can already take blood-pressure readings; capture an electrocardiogram (ECG) with apps approved by the U.S. Food and Drug Administration for consumers and validated in many clinical studies; perform limited DNA analysis; take an anatomical/physical ultrasound exam; track metabolism from breath, etc. Smartphones are set to continuously and passively via wearables to capture blood pressure and vital signs. In terms of other health related sectors such as our environment, there are now smartphone sensors that monitor our exposure to radiation, air pollution and pesticides in our food. Furthermore mobile and wearables are starting to blend together to form an integrated cocoon around the human, comprising networking, processing and sensing. That cocoon will lead to a meteoric rise in sensing the human (and therefore intimate data) as well as novel ways to “write back” to and influence the human beyond today’s mostly screen-based “nudges”. 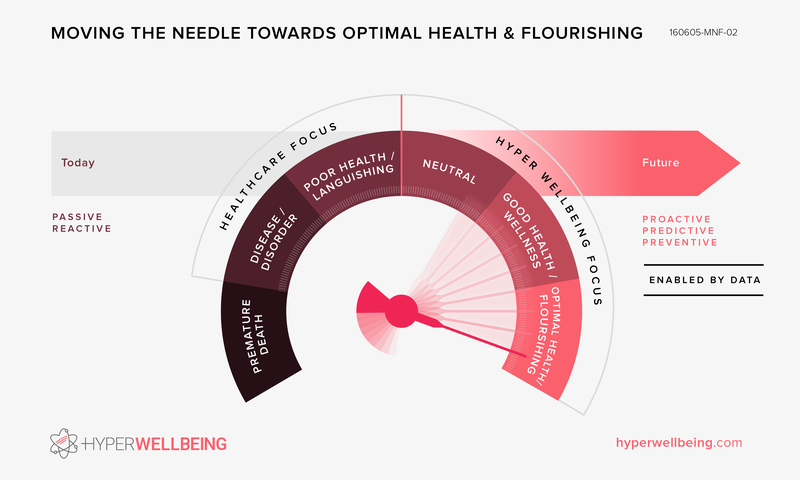 Just as we saw a sudden acceleration of the Internet and mobile in the 1990s, Hyper Wellbeing represents a comparable shift in the next decade. It’s a fundamentally new direction, and as such the mobile industry may not be able to continue in its present form of selling minutes, messages, megabytes. That has hit its peak of value creation, and this new industry ecosystem is forming to transcend it. 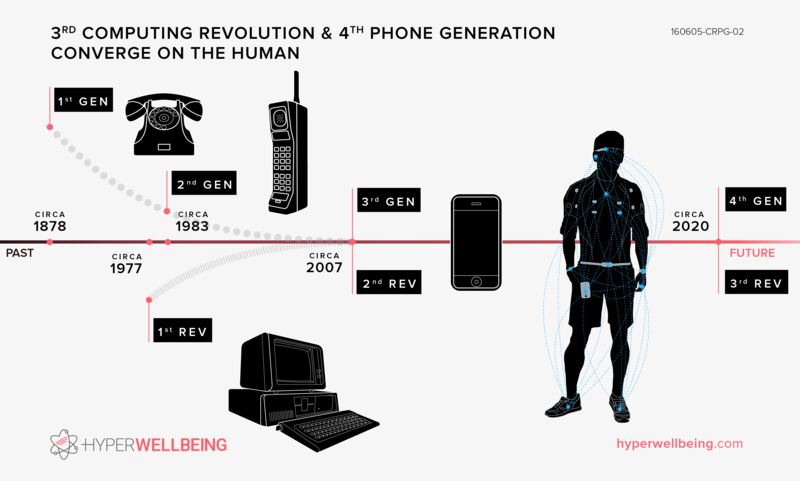 Hyper Wellbeing therefore is the “future of mobile”, in the sense that the existing category of “mobile” is being transcended. The value being offered by today’s mobile ecosystem may no longer be considered sufficient to be a core driver of industry revenue (because the ability to send pictures, texts, voice and video streams is becoming embedded into our environment). The value instead is moving towards leveraging the third computing revolution and intimate data. 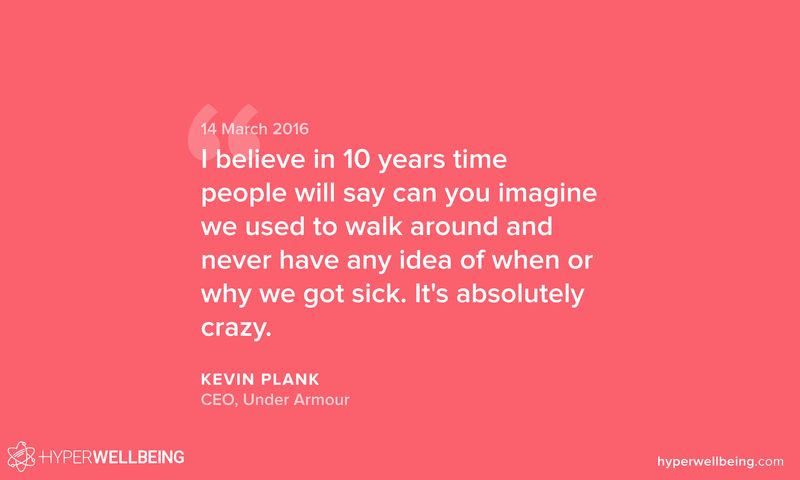 The current model for healthcare ultimately disincentivizes keeping us healthy through the decades. It has an economic model that incentivizes sick care over healthcare. Furthermore the US healthcare industry costs 18% of GDP ($2.9 trillion annually) with 88% of it being spent on preventable diseases; it’s predicted to soar to 21% of GDP by 2021. The system is fragmented into patients, providers and payers. Fragmentation gives rise to non alignment of interests; payers (the insurer or employer if they are subsidizing the insurance) have little interest in lifetime preventative focus (anything that takes more than three or four years to pan out) as benefits would likely accrue to someone else. To make matters worse a highly-disproportionate amount is spent in the last month/year of life that not only does not help but “is making that patient endure more bad experiences on a daily basis” . Technology innovation the past two decades has had negligible impact on wellbeing . However a confluence of technological factors is starting to spurn a new industry which is complementary to healthcare; focused towards prevention, amplifying our wellbeing and ultimately towards optimizing our ~28,000 days of lifetime. The factors are primarily a new era in computing – wearable, integrated with sensors, ubiquitous – an extension of our physicality (“third computing revolution”) giving rise to intimate data and novel ways to “write back” to the human; Big Data and a resurgence in artificial intelligence (machine learning in particular); rising availability of other high-value intimate data – our genome sequence in particular. The new ecosystem will be diverse. From mobile phone and wearable manufacturers. This is an immense opportunity to help foster the new industry and to innovate towards enabling us to start living within an optimal range of human functioning, the opposite of both pathology and languishing. This is why we need a new forum this fall.